5/8-3/4″ long. Dark brown with four light multi-colored patches on its wings; the head extends into a long thin “beak”. 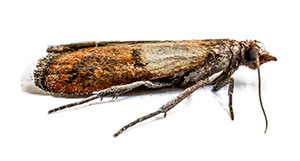 Indian meal moths are attracted to light and tend to become active around dusk. They make cocoons in wall corners and crevices, which are often mistaken for spider webs. The larvae look like small worms, they contaminate products they infest, and they’re capable of chewing through plastic and thin cardboard. Adults don’t live more than a week, but females are capable of laying 200 eggs at once, allowing infestations to get out of control quickly.